Vineland Research and Innovation Centre (VRIC) is conducting an online survey to better understand how it can adjust research efforts to help growers meet their challenges with pest management and increase profitability. Want to see more indepth Greenhouse Canada online features? Visit our Web Exclusives section by clicking on the link in the left-hand column. PRO-MIX® BX BIOFUNGICIDE™+MYCORRHIZAE™ is a general purpose peat-based professional growing medium suitable for a wide variety of horticultural plants and transplanting applications. 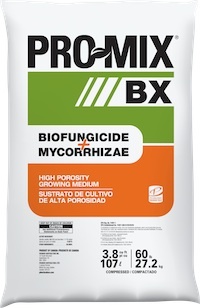 With PRO-MIX® BIOFUNGICIDE™ + MYCORRHIZAE™ you get the protection of a high-quality biofungicide working in synergy with the growth enhancement qualities of the only 100% contaminant-free mycorrhizae available in the market, MYCORRHIZAE™ PREMIER TECH. For a fourth consecutive year, Mastronardi Produce has been named one of Canada’s 50 Best Managed Companies. And that brings special recognition. JemD Farms – home to Red Sun and Golden Sun greenhouse grown-vegetable brands – has been named one of Canada’s Best Managed Companies for 2012. A Niagara College grad is helping lead a major sustainability project in food production at an innovative greenhouse project in Australia. It's the February 2013 cover story in Greenhouse Canada. This timely E-GRO Alert shows how Crop shrinkage is a profit killer. A simple one per cent increase in total crop sales can equate to a 24 per cent increase in your end-of-year profit margin.